Oracle Integration Cloud (OIC) brings together all the capabilities of Application Integration, Process Automation, Visual Application Building and Integration Analytics into a single unified cloud service. 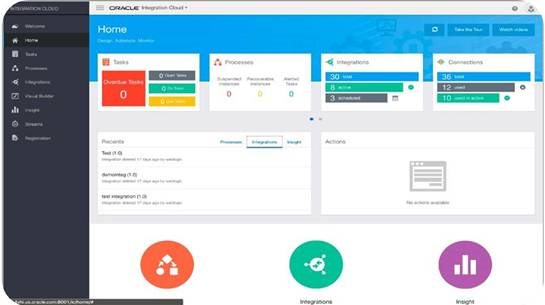 Oracle Integration Cloud now brings real-time and batch based integration, structured and unstructured processes, case management, stream analytics and integration insight allowing customers to service all their end to end integration needs in one cohesive platform so that all users can now build and deliver capabilities needed to realize true Digital Business Transformations. Billing is simplified with a single metric of OCPUs per hour (no more connection or user counting!!). Natively discover and invoke integration flows from processes in OIC and vice versa. Customers can configure and schedule patching according to their own schedule, and they can scale the Database to accommodate their business’s retention policy. The Integration Cloud runtime can be scaled out to meet the most demanding customer volumes, and VPN is now available so customers can choose to use the Connectivity Agent, API Platform, or VPN for on-premises application connectivity. · SaaS and On-Premises Integration: Quickly connect to 1000s of SaaS or on-premises Applications seamlessly through 50+ native app adapters or technology adapters. Support for Service Orchestration and rich integration patterns for real-time and batch processing. · Visual Application Design: Rapidly create and host engaging business applications with a visual development environment right from the comfort of your browser. · Integration Insight: The Service gives you the information you need — out of the box, with powerful dashboards that require no coding, configuration, or modification. Get up and running fast with a solution that delivers deep insight into your business. · Stream Analytics: Stream processing for anomaly detection, reacting to Fast Data. Super-scalable with Apache Spark and Kafka. Oracle Integration Cloud is an industry recognized leader in Application Integration and Process Automation. Both Gartner and Forrester have recognized Oracle iPaaS as a Leader for its vision and strategy in their respective reports for the year 2017. Oracle Integration Cloud is the only product on the planet that brings together all key elements of SaaS Extension and Integration under one product. The service also seamlessly integrates with Oracle API Platform Cloud Service for API first design and/or exposing Integrations as APIs.